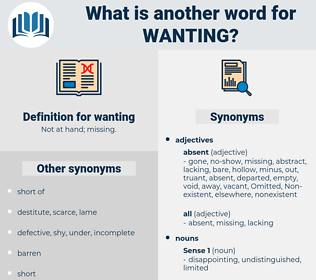 What is another word for wanting? waiting, Intending, wishing, insisting, wandering, striving, demanding, Expecting, endeavouring, Contemplating, Reiterating, aspiring, seeking, Attempting, Awaiting, inviting, ask, asking, Stipulating, shortcoming, Aiming, pretending, Amounting, hope, Hoping, Requiring, trying, pleasing, request, Requesting, wondering, struggling, Suggesting, thinking, Needing, stealing, urging, Favouring, attacking, Instructing, hunting, searching, feeling, Waging, always, catering, precisely, thieving, Defaulting, Soliciting, Applying, researching, appealing, finding, Claiming, hitting, directing, pending, sponsoring, project, willing, ensuring, sending, fighting, speaking, surrounding, vacuuming, ordering, meaning, playing, moving, lacking, beat, beating, missing, striking, lending, calling, flying, failing, dying, brooding, Begging, seeing, laying, Robbing, sucking, Stating, coming, going, looking, pulling, making, wish. wishes, likes, chooses, pleases, dictates, cares, Does. sated, entire, satisfied, filled, complete, replete. groovy, overflowing, alive, sizable, exceptional, active, prime, divine, A1, common, sufficient, oversize, copious, generous, special, existing, enlarged, fabulous, mediocre, minimal, keen, mean, wonderful, par excellence, swell, gratifying, jim-dandy, fancy, fair, satisfying, superlative, top, fine, premium, first-rate, superb, nifty, apparent, obvious, high-grade, plenteous, tip-top, thriving, slick, better, banner, equal, uncanceled, crackerjack, passable, middling, evident, marvelous, present, lavish, tolerable, largish, capital, abounding, stellar, average, neat, current, dandy, so-so, king-size, supernal, substantial, hefty, plain, liberal, prevalent, borderline, bountiful, plentiful, decent, teeming, unsurpassed, super, abundant, choice, grand, animate, terrific, useful, large, sterling, suitable, prevailing, noble, rich, splendid, big, heavenly, sensational, conspicuous, luxuriant, going, superior, classical, living, considerable, jumbo, classic, bounteous, top-notch, expanded, existent, great, respectable, standard, first class, unexceptional, boss, worthy. I've been wanting to have you a long time. Oh yes, and you are wanting to see him, Sir Keith?